Fillers can help to soften lines in the face and restore volume. As we age, our facial ligaments become lax and some degree of fat is lost. These processes combine to create grooves in the face in areas that they are unwanted such as under the lower eye lids (“tear trough deformity”) and around the mouth (“laugh lines” or “nasolabial folds” and “marionette lines”). This also results in malpositioned fat pads, causing “jowling.” The loss of fat leave some areas sagging or devoid of fat, resulting in thin lips or loss of cheek definition. Still other deep lines are created simply from repetitive facial muscle movements. These include “the 11’s(vertical lines between the brows),” “crow’s feet (lines from the corner of the outer eye),” “laugh lines” and horizontal forehead wrinkles. For many of these problems, the solution is filler. 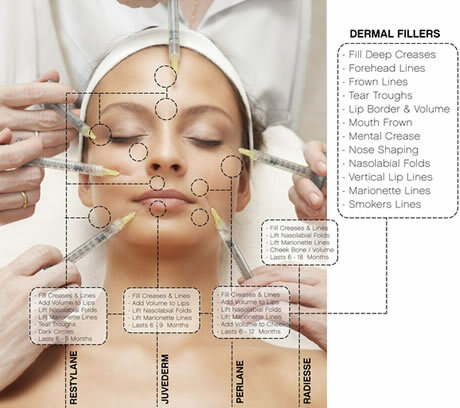 There are many different types of filler on the market and each may be indicated for a different purpose. Most fillers are made from hyaluronic acid, such as Juvederm, Restylane, Perlane, Belotero. The benefit of this substance is that it has an anticdote (hyaluronidase) , that can instantly dissolve the product if the patient is not satisfied with the result. Still others are made of other substances such as calcium (Radiesse), poly L acid (Sculptra) and encourage native collagen ingrowth. The substances differ in the degree of crosslinking and therefore how long they last in the body (3 months to 2 years) and how easily manipulated they are. The more viscous the product, the more superficial it can be placed. 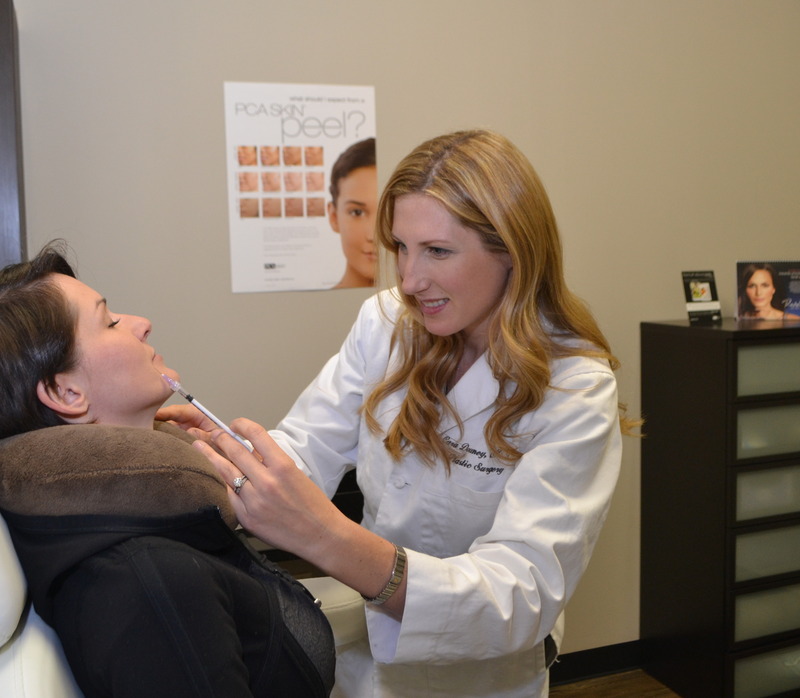 Dr Downey can help you to decide which product is best for which area of concern and desired effect. She can also help to estimate how much product may be needed to produce the desired effect. Ideal patients for dermal fillers have a realistic expectation. These changes are meant to be subtle such that friends may comment that you look “refreshed” or “well rested” but may not be able to necessarily know what has been done. Fillers can be comfortably done in the clinic setting with the use of topical numbing medicine or regional blocks (like at the dentist). Some fillers have numbing medicine incorporated into the syringe for more patient comfort. It is recommended that if possible, patients are not taking any blood thinners as this can lead to more bruising. Some swelling and bruising can be expected for days after therapy and can last up to weeks in rare cases. Ice packs may help for the first 24-48 hours.